Do you really want to find out what is on the Stranger's Bookshelf? It could cause shock and awe, or amaze you and cast wonderment. What secrets does it behold? Come and browse on The Stranger’s Bookshelf. In the last chapter of Fairies of the Realms we introduced the Dark Fairies of the Unseelie court, Today I would like to talk about the Brownie and the Boggart which are specific forms of the goblin family. The Brownie is a mythical fairy creature very similar to the hob goblin, approx. 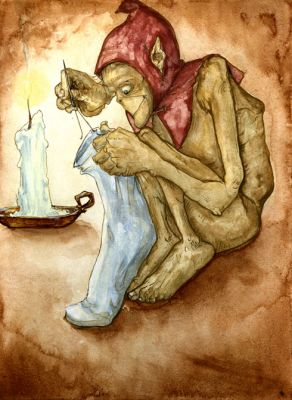 Three feet tall they are mostly found in English and Scottish folklore tales. 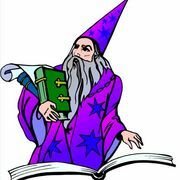 They are also depicted in the works of J K Rowling and J R Tolkien. In J R Tolkien’s Middle Earth they are portrayed as The Orcs, and in J K Rowling’s Harry Potter, The basis of the House-elves is derived from folklore on Brownies. “Dobby” is used both for the house elf and as a name for brownies in Yorkshire, and “Mr Dobbs” in Sussex. Brownies are best known in various tales as the Keepers of the Feather of Hope, this means that all hope on earth is replenished and given back to the earth. Many Brownies are always depicted as deformed in some way, one description is that the Brownie has an large oversized head. The Brownies are known to be very friendly and orderly creatures, and they go to great lengths to keep a household neat and tidy. To have a Brownie in your residence is considered very lucky. They become attached to certain homes, the most popular being various Manor style houses. They also like to dwell in barns and other various types of farm dwellings as they have a really strong love for the countryside. 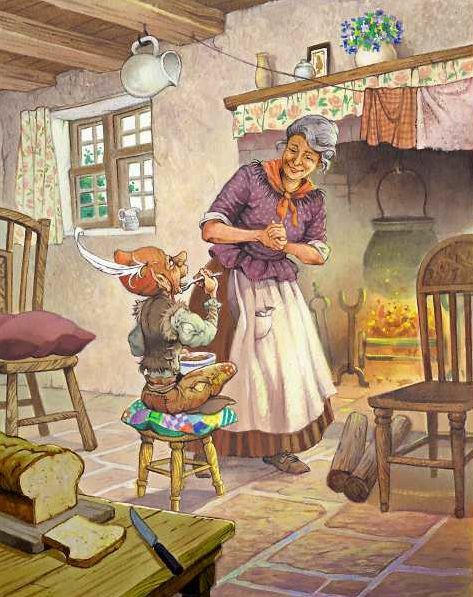 Very often you would find in these country homes a small empty seat which is often left by the fire which is solely for the Brownies use so he can relax by the fire when his labor is done, this is mostly done out of folklore tradition. The Brownies will also make their homes in dark cupboard corners or in the base of hollow trees. The Brownie is known to work for their keep as they love to keep busy, they will only come out at night as they do not like to be disturbed at any cost. 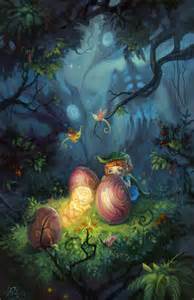 There have been various stories in fairy folklore of accounts of Brownies being heard at night going about their chores. Brownies are very industrious and are very good at mining and metal work. Sometimes when the Brownie is feeling bored or mischievous, he likes to rearrange things, and has been known to rearrange a whole room on a whim. This is why there must always be lots for him to do as they can wreak havoc when restless. Also folks had to be careful to never to cross a Brownie as they will go to great lengths to seek revenge. It is also said that Brownies could turn into malevolent Boggarts if offended or ill-treated. It was also known that giving rewards to a Brownie were totally taboo for Brownie folk, but you could win their favour, and stop them from wreaking havoc by leaving a dish of cream or bread and milk. They also are partial to porridge and honey. In some of the old Folklore tales it states if you make this little creature a new suit and he puts it on he will vanish forever and will never be seen or heard from again. This is where J K Rowling got the idea of Harry giving Dobby the sock in the Harry Potter series, in order to release Dobby from the Malfoy family stranglehold. It is also stated in folklore that the Brownies were mostly visible to people with second sight, but often times the were visible to ordinary people as well. Even though the Brownie is a considered a seelie by nature, The Brownie loves to play tricks on the unsuspecting Seelie fairy court, so consequently they never get invited to join the fairy circles. Another tidbit is that the Brownie love to ride on all types of birds and small animals and is considered it’s main form of transportation. An really interesting fact is that the junior girl guides were named Brownies by Lord Baden- Powell in 1918 because the little girl guides were considered little helpers, and so to Lord Baden- Powell this was a fitting title. Brownies are also considered relatives of the Boggarts in Yorkshire. The Boggart is a much darker version of a Brownie in appearance and demeanor. The Boggart is described as a house spirit something akin to a poltergeist. A Boggart’s appearance is said to be very hairy and ugly and almost beast like. 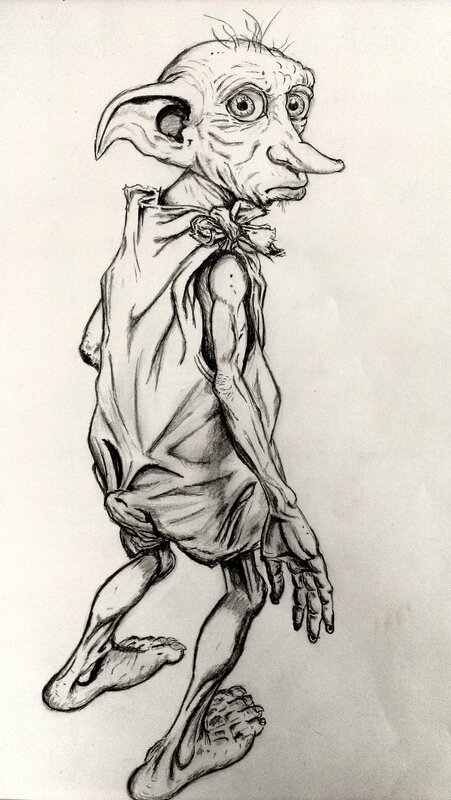 The Boggarts dress mostly in rags and are very uncouth. Boggarts and Brownies in a tree. Anyone that was thought to have a Boggart would do their utmost to get rid of it. This could be a feat unto itself because when a household tries to move the Boggart will try to tag along, especially when the families are so frustrated as this would be very amusing to this creature, making him impossible to get rid of. 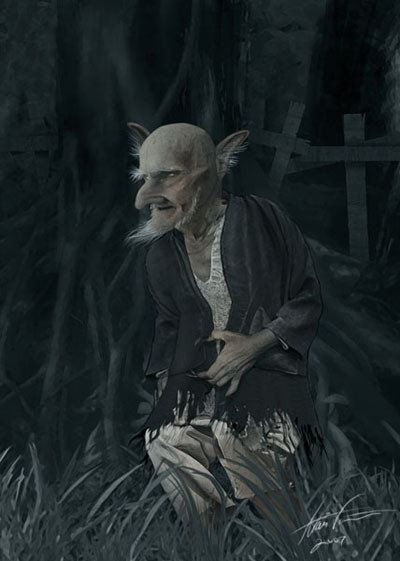 The bogeyman is also sais to have derived from the folklore of the Boggart as it is said that the boggart crawls into people’s beds at night and puts a clammy hand on their faces. Sometimes he strips the bed sheets off them. One of the means of getting rid of a troublesome Boggart is to throw a handful of flax seed on the floor. 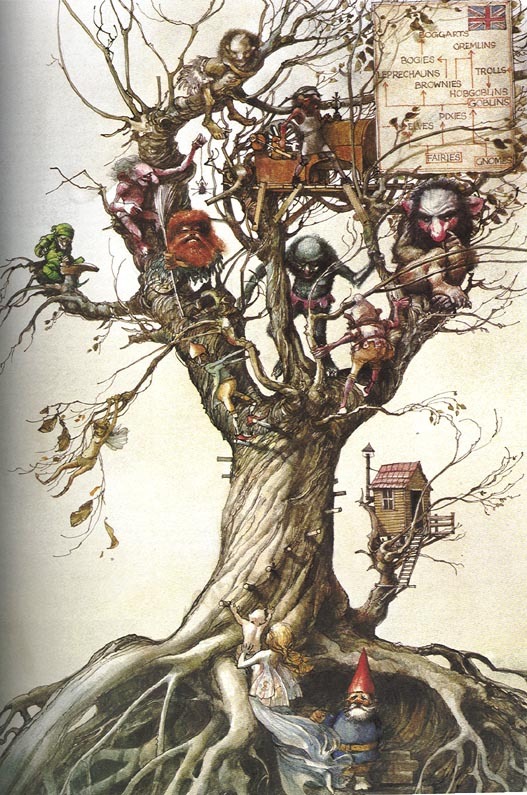 Because the Boggart is akin to the Brownie they are compelled to pick up every grain of flax, which takes considerable time in which the Boggart gets frustrated and leaves. Another method is Hanging a horseshoe on the door of a house and leaving a pile of salt outside your bedroom are said to keep a boggart away. A pile of salt that was left outside a door. Boggarts also feature prominently in a number of fantasy fiction. The “boggles” of C. S. Lewis‘s Chronicles of Narnia are considered to be Boggarts. What is also interesting is that the boggarts of J. K. Rowling’s Harry Potter series are unlike most boggarts of British folklore. Their closest parallel, in being able to change shape at will, is probably to be found in a reference to a Lancashire boggart in the book Lancashire Folklore of 1867. 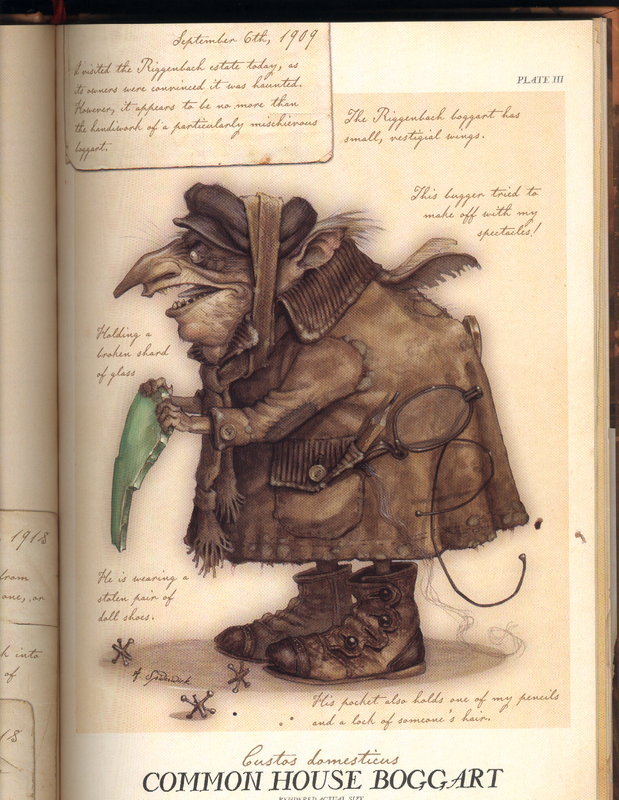 Boggarts also feature prominently in The Spiderwick Chronicles by Tony DiTerlizzi. 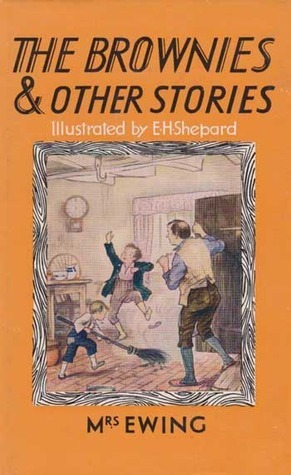 The Brownies and Other Tales by Julia Horatia Ewing. 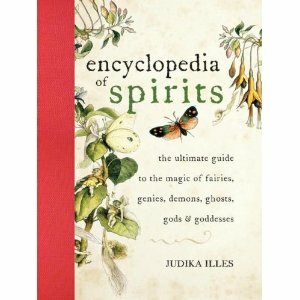 Posted on July 15, 2013, in Folklore and tagged Boggart, Brownie, Classifications of fairies, dobby the house elf, Faerie, faeries, Fairies, Fairy, fairy folk, Fairy legends, Fairy Lore, Fairy Realm, Harry Potter. Bookmark the permalink. 4 Comments.